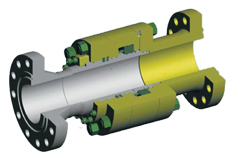 The Oil States Pressure Balanced Safety Joint (PBSJ) is a safety fitting designed to separate at a preset axial load independent of pipeline pressure. The fitting is used to prevent damage to platforms, tanker-loading operations, subsea production systems or lateral tie-ins where anchor dragging, mudslides, iceberg scouring or other force may cause damage. Tension load is transferred through the PBSJ fitting via shear pins. When an external force exceeds the shear pin rating, the PBSJ separates, preventing damage to your equipment. Upstream and downstream check valves prevent further product loss upon separation. A split retainer prevents premature separation during installation. A separated PBSJ can be refurbished by an Oil States technician. Separates at preset load to prevent equipment damage. Utilizes upstream and downstream check valves to prevent product loss and environmental damage. Will accept pigging operations when check valves are set open. A separated PBSJ can be factory refurbished. Split retainer prevents premature separation during installation.